There are some basic principles you can follow and steps to take to protect your home, family, business, and community. But when a hazard is headed your way, pay attention to the local, state and federal authorities, those trained professionals who are dedicated to assisting you by making sure you are properly protected. Adhering to their advice and orders can save you from costly damage and heartbreaking loss. Yes, the authorities and their protocols are there to help you. And in worst-case situations, their command and control presence will be a community’s balm in Gilead. The Federal Emergency Management Agency (FEMA) works to plan and prepare for natural disasters and crisis situations, assist disaster survivors, and organizes post-disaster response and recovery. They also provide information to states and municipalities about how to prepare and plan for disasters as well as protect lives and property when disasters strike. When natural disasters occur, the National Guard and Coast Guard are activated to assist emergency responders to protect lives and rescue those endangered by the disaster. If there is an environmental disaster, such as an oil spill, the Coast Guard and regional Environmental Protection Agency assist the Rhode Island Department of Environmental Management in the cleanup and recovery process. Municipal first responders, emergency services, and local police and fire departments are responsible for protecting lives during emergencies and natural disasters. They may be called to assist in evacuating high-risk areas, transporting vulnerable individuals to emergency shelters, and rescuing individuals in danger. 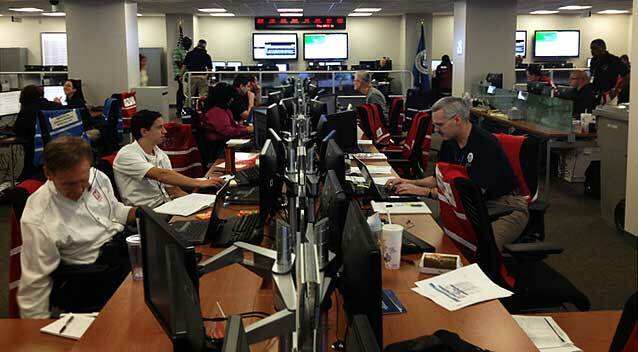 The Federal Emergency Management Agency (FEMA) Command Center in Washington, D.C. The American Red Cross mobilized more than 5,300 employees and volunteers in response to Superstorm Sandy. They distributed more than 1.5 million relief items and served more than 4 million meals and snacks. New York City is generally praised for its post-Sandy relief actions, but a federal court decided that New York City did not do enough to protect persons with disabilities. This is the first ruling of its kind in our country and could result in big changes for our cities and the 73 million disabled people in the U.S. Almost 116,000 National Grid customers lost electricity in Rhode Island when Superstorm Sandy hit. Within three days, National Grid restored service to over 105,000 of those customers.